Whenever 12-year-old Wayne Kovok felt uncomfortable, which was often, his default was to fill conversational voids with some of the random fascinating facts he’s always collected. But after surviving a plane crash, he’s robbed of speech for a long period of healing and has to redefine himself. That would be hard enough, but he’s also grieving the death of a favorite uncle, always falling short in the eyes of his highly critical ex-military grandfather, and trying to deal with the repeated hurts and disappointments provided by his absent divorced father. Wayne is consistently good company, and it’s a great pleasure to cheer him on as he heals and finds his way. 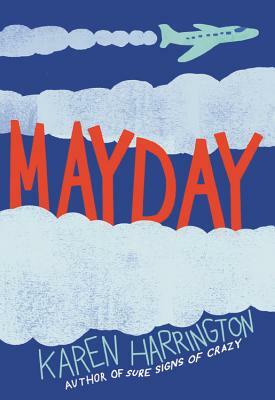 Filled with Karen Harrington's signature heart and humor, Mayday tackles an unforgettable journey of family and friendship. Karen Harrington was born in Texas, where she still lives with her husband and children. She is the author of Sure Signs of Crazy and Courage for Beginners. You can visit her karenharringtonbooks.com. * "A fine character-driven tale that slowly grows to a crescendo of satisfaction." "The main characters are well depicted and highly appealing.... Thought provoking and touching, Mayday applies to anyone who has ever felt like an outcast and wishes to become someone with a sense of pride." "Wayne's is an authentic, funny, and sometimes sarcastic teen voice, which comes through clearly, even when he can't speak out loud.... in this sweet tale of survival, heroism, and the search for strength."